On AWS, Altus Director requires a dedicated Amazon EC2 instance. The simplest approach is to create this instance in the same VPC and subnet where you want Altus Director to create new instances for Cloudera Manager and your CDH clusters. Note: Alternatively, you can install Altus Director in a different region, on a different cloud provider, or a different network environment. For information on these more complex setups, see Running Altus Director and Cloudera Manager in Different Regions or Clouds. In the AWS Management Console, select EC2 from the Services navigation list box in the desired region. Click the Launch Instance button in the Create Instance section of the EC2 dashboard. Select the AMI for your Altus Director instance. Cloudera recommends that you choose from the Community AMIs list and the latest release of the desired supported distribution. See Supported Software and Distributions. Select Community AMIs in the left pane. In the search box, type the desired operating system. For example, if you type rhel-7.3 HVM, the search results show the versions of RHEL v7.3 that support HVM. Select the highest GA number to use the latest release of RHEL v7.3 supporting HVM. Click Select for the AMI version you choose. Note: For more information on finding AMIs, see Choosing an AMI. Select the instance type for Altus Director. Cloudera recommends using c3.large or c4.large instances. Select the correct VPC and subnet. The cluster launcher requires Internet access; from the Auto-assign Public IP list box, select Enable. Click Next: Add Storage. Altus Director requires a minimum of 8 GB. Click Next: Add Tags. On the Add Tags page, click the Add Tag button. For the Name key, enter a name for the instance in the Value field. Optionally, click Add Tag again to create an additional tags for the instance (up to a maximum of 50 tags). Select either Create a new security group or Select an existing security group. If you create a new group, enter a Security group name and Description. To edit an existing group, select the group you want to edit. Click Review and Launch. Scroll down to review the AMI details, instance type, and security group information, and then click Launch. 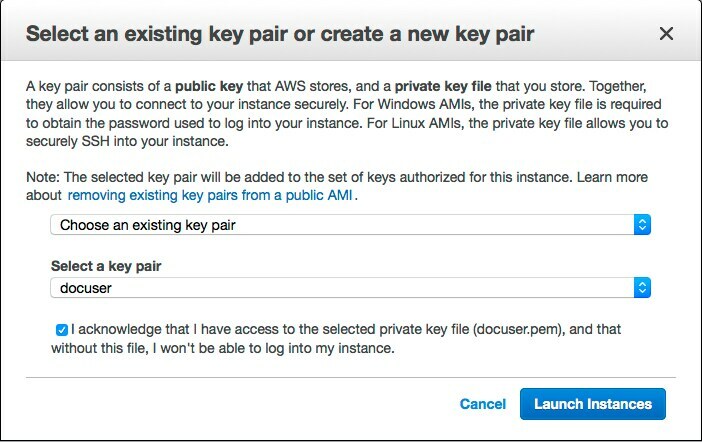 Select Choose an existing key pair and select the key pair you created in Preparing Your AWS EC2 Resources. Click the check box to acknowledge that you have access to the private key. After the instance is created, note its public and private IP addresses. You are now ready to install Altus Director server and client on the EC2 instance.